Nordic Spice has a passion for creating quality spices, spice blends, barbecue sauces/glazes and marinades. We make our own blends and flavours for our clients and invest in making client-unique solutions. · We have the market’s widest selection for cooking in store and supermarket-delis as well as Foodservice/restaurant. · We have many unique high-quality spice blends, barbecue sauces/glazes and marinades. · We also make our own blends and flavours, so called client-unique products after the clients’ wishes. As a complement to our selection we also have high-quality Beef Jus and different(glace) and stocks from Essential Cuisine. Most spices, dry herbs and spice blends from Nordic Spice can be bought in large package such as for example 11,7 litre bucket and sack if so wishes and the marinades/sauces in 25 L can. An inspiration and information source for you who work in restaurant and supermarket-delis. 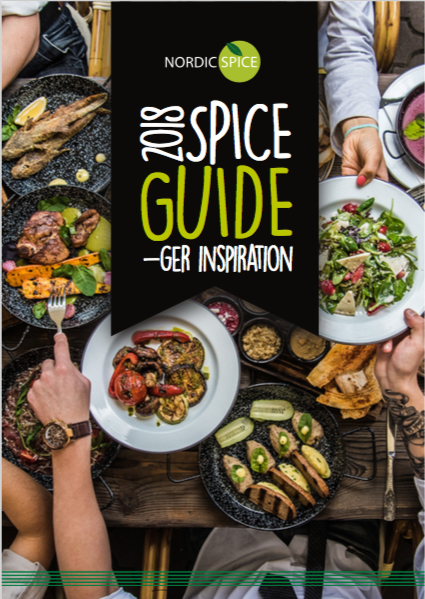 Our new Spice guide is an inspiration and product guide that makes life easier for you and your co-workers who work in restaurant and supermarket-delis, the Spice guide will be updated once a year and exists both as a printed matter and to be downloaded from our website. Contact us if you wish for more copies or have any queries about how to use our Spice guide. Clear introduction of spices, marinades and other selections. Easy to find the right product and at the same time get tips and ideas. Symbols that give guidance to which meat or fish the product is best suited for. See our product selection in the Spice guide!